Start out at 7am with an organic breakfast at Sentient Bean, or try the best warm handmade croissants stuffed with anything – from blueberry cream, chocolate, spinach and feta or ham & Swiss cheese at the Goose Feather’s Café (7am weekdays, 8am weekends). If you’re looking for coffee and tea choices, try Gallery Expresso, Savannah’s oldest coffee bar. For the best overview of historic Savannah, hop on the orange and green of Old Town Trolley Savannah for a narrated tour. Depending on how you want to use your time and get around, stay onboard for the full 90 minute loop tour to get your bearings, see a lot and learn a lot. Or hop off and on to explore the interesting areas around 16 convenient stops. 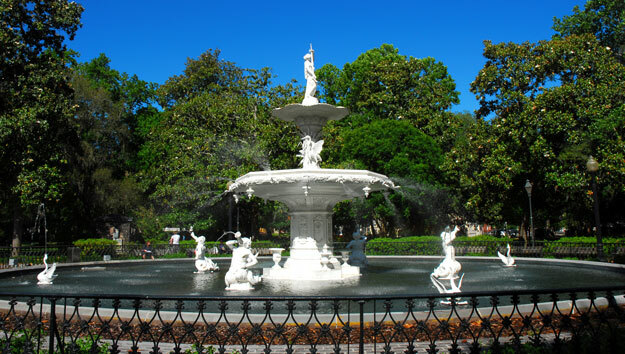 See historic Savannah at your own pace by walking around some of her 21 shady, park-like squares. Each is unique. Laid out by founder James Oglethorpe in 1733 in the settlement plan of a grid system of wards centered by a communal park-like space, the moss-draped squares give the area the languid charm of an earlier era. Around the squares, charming, architecturally significant historic buildings add to the charm. Browse through an eclectic mix of stores, art galleries and antique shops. Chill at one of the many locally-owned coffee houses; sit on Forrest Gump’s bench in Chippewa Square; look at books in E. Shaver’s bookstore on Madison Square. If you prefer a guided tour, Cool Savannah’s Architectural & History Tour covers a lot of ground in 90 minutes, beginning at 10:30am. For those interested in more details about Savannah’s architectural gems, Architectural Tours of Savannah offers a daily 90 minute walking tour beginning around 10am. To experience yet another chapter in Savannah’s history, walk through the life of African Americans from before the Civil War until the Emancipation on Indigo Journey’s interesting and though-provoking 90 minute Walking Tour of Antebellum Period departing at 10am and 4pm (Sundays 1 and 3pm). Walk along charming brick-paved, tree-shaded Jones Street to get to Mrs. Wilkes Dining Room. Plan to get there by 11 to queue up for genuine southern food served family-style until 2pm. If you don’t want to stand in line, enjoy the comfortable vintage atmosphere and tasty lunch in Gyphon Tea Room. Several of Savannah’s impressive collection of beautifully restored Federal, Georgian, Greek Revival, Gothic Revival, Italianate, and Victorian homes are open to the public.Furnished with antiques and artifacts of the period, each tells a fascinating story through the lives of those who lived there and the prominent people who visited. All are standouts, making choosing one or two difficult. Beautifully restored 1820 Davenport House is an early Federal-style treasure; Owens-Thomas House, a 1819 antebellum gem; Gothic Revival elements make mid-1800s Green Meldrin House stand out. Regency-style 1820s Juliette Gordon Low House is a Girl Scout must see; stucco and brick Italianate Villa-style 1848 Andrew Low House offers a glimpse into the elegant Savannah lifestyle when “cotton was king.” Can’t decide? Partners in Preservation is a package of admission ticket to Davenport House, Andrew Low House and 1818 Greek Revival Scarborough House, home of the Ships of the Sea Museum. SCAD, Savannah College of Art & Design, has had significant influence on the growth and development of Savannah as a center for art, giving Savannah an edgy, trendy side. See exhibitions of stunning, avant-garde works of SCAD students and acclaimed artists in SCAD Museum of Art. If contemporary art is not your thing, visit Telfair Academy where two 19th century period rooms and a collection of 20th century American and European art are exhibited in a an exquisite 1819 neoclassical Regency style mansion. Enjoy a wonderful Savannah Low-country inspired dinner in the elegant ambiance of a historic house. Olde Pink House overlooking Reynolds Square is a Georgian 1771 landmark. Start the evening with a drink in Planters Tavern downstairs, then move upstairs for a Southern Cuisine dinner in beautifully appointed rooms. Elegant 700 Drayton, inside an art-filled Victorian Romanesque mansion built in 1888, now beautifully restored into a boutique hotel overlooking Forsyth Park, offers a delightful culinary experience of regionally inspired dishes. Dress at both Olde Pink House and 700 Drayton is casual resort/casual dressy. Dining at Elizabeth on 37th, where jacket and tie are required, is a delightful experience of creative Southern Coastal cuisine served inside an elegant 1900s Victorian-era Southern Mansion. Brunch by Land or Sea at Huey’s on the River, a New Orleans-style Brunch is served every day. Henry’s serves all day breakfast and reasonably priced buffet on Sundays. B Michaels Eatery and J Christopher’s serve a breakfast all day that could easily pass for brunch. Sentient Bean is good for breakfast any day, serving brunch on Sundays only. Trendy Soho Café, equal parts restaurant and art gallery, is the place for a fabulous brunch on Sundays only. If the thought of shrimp and grits or crab cakes for Sunday brunch make your mouth water, Driftway Café is your choice. 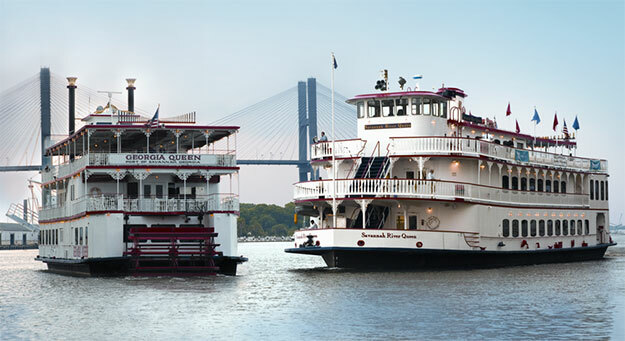 Or get out on the river for a lavish buffet while cruising lazily along on a scenic Savannah Riverboat Brunch Cruise. Walk along the historic riverfront, down old cobblestone and brick streets lined with brick buildings housing stores, restaurants, bars, hotels and inns in what once were cotton warehouses. Watch pleasure boats, sightseeing steamboats and cargo ships making their way up the river. Find galleries, bookstores, curios and gift shops, even one filled with Civil War artifacts. Check out souvenir shops, a peanut shop and sweet treats to take home. Don’t forget Savannah’s signature pralines! Explore City Market, an 18th century open-air market converted into a 4-block place to shop, eat, drink and admire the work of local artist in bright, airy galleries filled with colorful art. See the work of artists in their loft studios in the upstairs Art Center – photographers, painters, sculptors. Catch an artist at work, if you’re lucky! A must-see – the Gullah/Geechee gallery space with its paintings and great collection of sweetgrass baskets. Lunch in outside terraces or inside one of the restaurants or keep it simple enjoying what is considered to be Savannah’s best pizza at Vinnie Van GoGo. Visit Bonaventure Cemetery, high on a bluff overlooking the marsh about 5 miles east of historic downtown, sits beautiful Bonaventure Cemetery, a 1846 Southern Gothic “garden” or “rural” cemetery straight out a Victorian-era novel. See it as Savannah residents did at the time – a beautiful place to remember those lost by strolling through elaborate sculptures in a serene park-like setting. You’ll need transportation to get there. While you can actually drive down the main cemetery road, several companies offering walking tours provide shuttle service. For a different experience, glide through the cemetery on Segway of Savannah’s Bonaventure Cemetery Tour. Venture into Savannah’s Dark Side on a Ghost Tour. 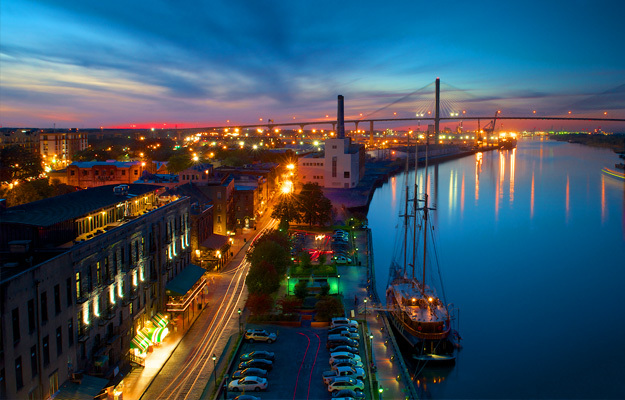 With over 1600 historic buildings, many owned by families who trace their ancestry back generations, Savannah is one of the most haunted cities in America. Every evening, numerous Ghost Tours venture into paranormal Savannah by vehicle or on foot. Board the “Trolley of the Doomed” for a narrated ride into the dark side on Old Town Trolley Tours Ghost & Gravestones Tour. Ghosts Hosts recount grizzly tails as the black trolley slowly passes by places known to be filled with haunts. Hop off at two haunted places to venture inside to experience sudden chills, creaks and possible orb sightings of lingering spirits. Toast a Great Two Days in Savannah from a Rooftop Bar. End a two fabulous days in Savannah with drinks and small plates in a rooftop bar with a view – Rocks on the Roof on top of the Bohemian Hotel; Perch, the rooftop bar and lounge on top of Local 11 Ten, a great restaurant near Forsyth Park; Top Deck, the rooftop bar of Cotton Sail Hotel.